US President George W Bush has told Sudan to halt violence in the troubled Darfur region, as pressure for international intervention increases. Mr Bush urged Khartoum to rein in the Arab militia known as the Janjaweed, and allow relief agencies to work. His comments came after the US Congress - in a non-binding vote - called the Darfur crisis a "genocide". The UN and the White House have so far avoided that label, which would entail an international duty to step in. The US congressional vote on Darfur has met with a sceptical international response. The human rights organisation Amnesty International said crimes against humanity were being committed, but it could not confirm that they complied with the definition of genocide. The African Union - which is deploying ceasefire monitors in Darfur - says it does not believe the violence amounts to genocide. Mr Bush, for his part, again criticised the Sudanese government. "They must stop Janjaweed violence, they must provide access to humanitarian relief for the people who suffer," he said in a speech in Washington. He added that the US was working with the UN and the African Union "to bring relief to the suffering people in that region". Pro-government Arab militias have forced more than one million black Africans from their homes and killed thousands in Darfur. The US is proposing a UN resolution threatening Sudan with sanctions. But on Thursday, US Secretary of State Colin Powell restated the administration's cautious line on how to label the conflict. "There is a legal definition of genocide, which includes specific intent to destroy an entire group," he said. "We will make a judgement in due course," Mr Powell added. A 1948 UN convention says the international community must prevent and punish acts it has declared as genocide. On Thursday, the US Congress unanimously approved a resolution urging the president to call the situation in Sudan "by its rightful name - genocide". It urges the Bush administration to consider "multilateral or even unilateral intervention to prevent genocide should the United Nations Security Council fail to act". The Sudanese government has promised to disarm the militiamen, but the US says this has not yet started. The draft US resolution calls on Khartoum to crack down on the Janjaweed, which are accused of carrying out thousands of rapes and killings in Darfur, or face further action, including possible sanctions. Sudan denies backing the Janjaweed, and has warned the US and UK not to get involved in the conflict. The government has sent some 6,000 policemen to Darfur but the BBC's Hilary Andersson says those who have fled their homes are afraid of "uniformed men of any kind". They accuse Sudan's security forces of working closely with the militias. 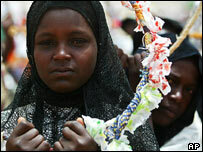 Sudan blames the conflict on rebels who took up arms last year, demanding greater rights for Darfur's non-Arab groups. "More than a million people are now homeless"